Arrowhead Point: 2 - 3 Bedroom Townhome Listings: Browse through the Arrowhead Point accommodation options below and book your favourite instantly online with the owner. View extensive photo galleries of the exact rental you'll be staying in and access detailed information including amenities, rates, availability, property layout and unique property features. Alternatively, get a complete Arrowhead Point Whistler analysis and learn about the area, what's nearby, pros/cons and more! View a Whistler Arrowhead Point map to get a feel for its location and proximity to shops, restaurants and other points of interest. SKI IN AND SKI OUT to your one level, peaceful mountain retreat with a PRIVATE HOT TUB and free village bus. Accommodation in Whistler by Development - compare complexes including amenities, location, suitability and more. Whistler Accommodation Resources - Visit our Whistler lodging resource centre for booking tips, standards & guarantees. Search all Whistler Accommodation - With over 550+ top-located Whistler vacation rentals, you'll find what you want in less than 2 minutes. Whistler BC Trip Planning & Deals -Visit our Whistler homepage for trip planning resources, weather forecasts & huge direct booking deals on lift tickets, gear rentals and more. Arrowhead Point Whistler Homeowners - List your Rental! Manage your own Arrowhead Point Whistler vacation rental business, even if you live oceans away! Dump expensive commission fees and take control of your Arrowhead Point property in less than 5 minutes per day, irrespective of what time zone, country, state or province you live in! For a flat annual subscription fee, we teach you how to do it and give you powerful online tools, services, business and marketing tips that help you capture more business from all of your marketing channels. Learn more about how to take control of your Arrowhead Point Whistler vacation home or contact us to learn more. Own a Vacation Rental in Another Destination? 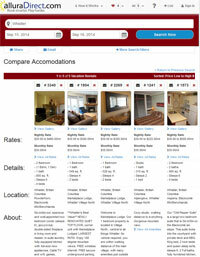 We list vacation rentals in other destinations. We help Owners and small, local, independent lodging companies succeed online through all of their marketing channels. For a flat annual fee, we show you how and give you all the online tools, services and tips to market and manage your vacation rentals remotely with ease, confidence and enjoyment. View vacation rental service details or contact us for more info.